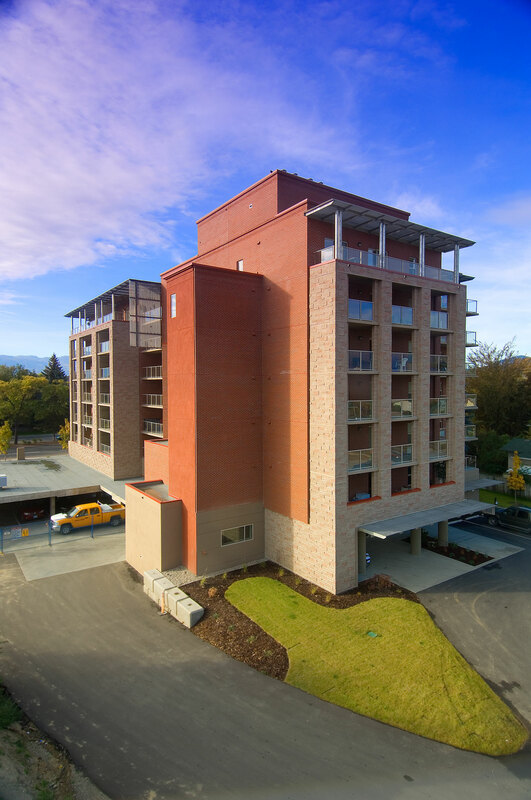 Designed with the ability to build in multiple phases, this rental apartment complex is located in the heart of Kelowna, B.C. along highway 97 (Harvey Avenue). The complex is conceived as a series of buildings of various heights surrounding a central raised plaza. Each of the buildings responds to their surrounding context but required several bylaw variances to be allowed by the City. As a result we worked closely with the City throughout the design to ensure they understood the rational and were onside with our direction. 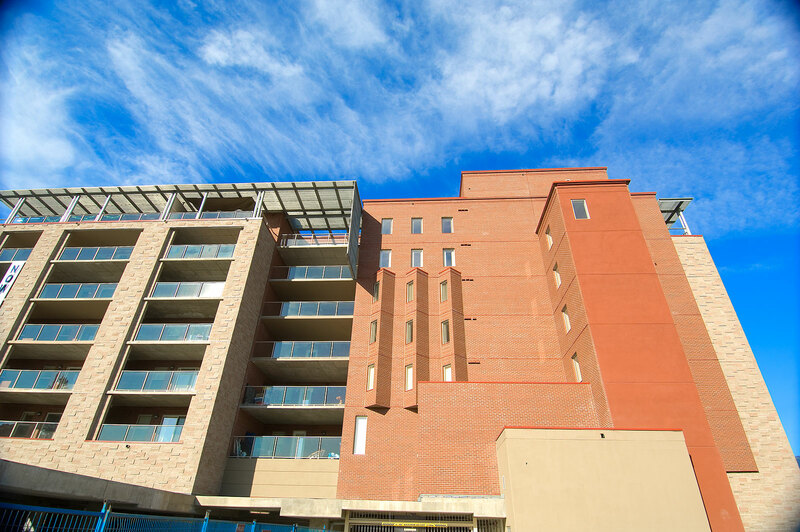 The final configuration features a seven story building on the west end of the property and a six storey building on the east end. Both buildings respond to potential larger buildings that can be built on the two adjacent lots. These buildings are set further back on the site away from Leon Avenue, a street that is composed mostly of small one and two storey homes. Two four storey buildings infill the space between the end buildings and are set closer to the street allowing the full complex to step down to a smaller scale along Leon Avenue. All four of the buildings wrap around a raised landscaped plaza. The parking garage is concealed below the plaza and most of the buildings. The buildings themselves are composed of four different components, the solid mass of the building (clad in smooth brick), the horizontal extensions of the concrete decks, a series of rough masonry clad frames (clad in split face concrete block) and bending metal canopies. All four components work together to create a dialogue between buildings, the street and the plaza. The concept for the use of the two masonry materials is an interplay of smooth faced brick for the main massing of the building juxtaposed with the rough frameworks of split face concrete block. 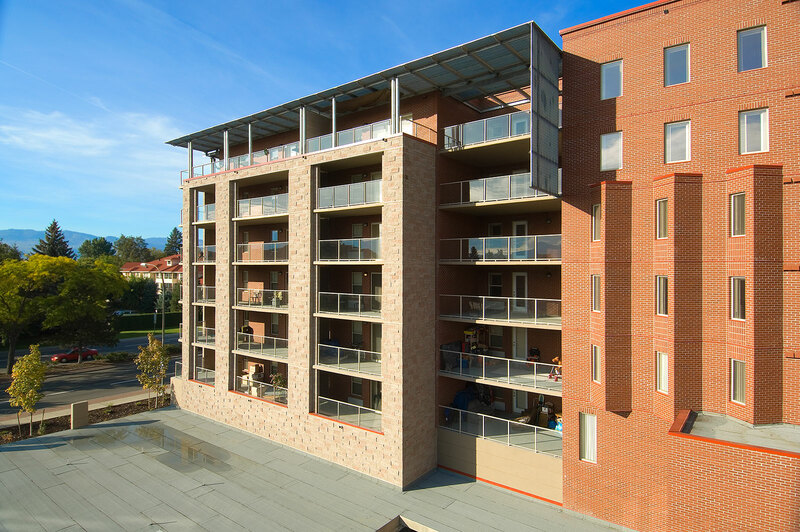 The split faced clad frames contain the outside edges of the balconies acting as boarders to the plaza and also scaling down the building at the perimeter edges. A series of metal canopies or brise-de-soliel bend and wrap around the building both capping the building off as well as marking all points of entry into the building. The canopies also bend to contain and reframe areas or the building massing. The base of the building is an exposed architectural concrete plinth that anchors the mass of the building to the ground. 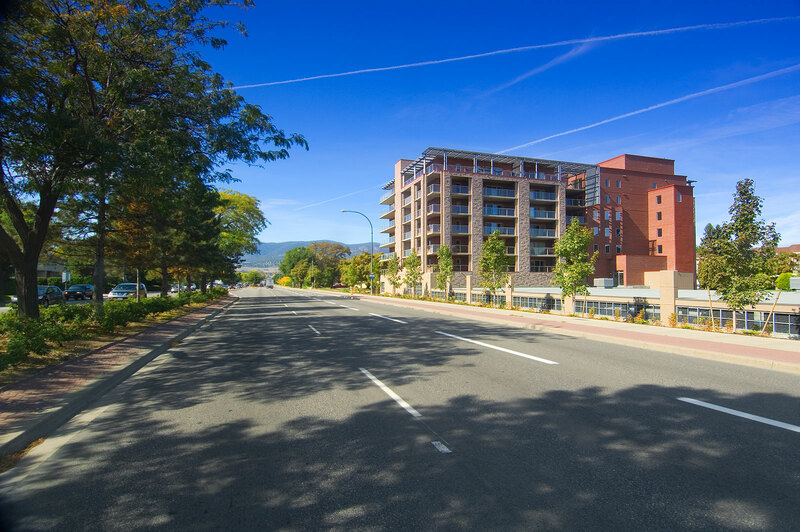 The buildings are designed to keep in mind the warm summers that are common place in Kelowna; access to outdoor space was one of the main driving points of the design. Grand scale balconies extend the outdoor living space with access to mountain and city views. 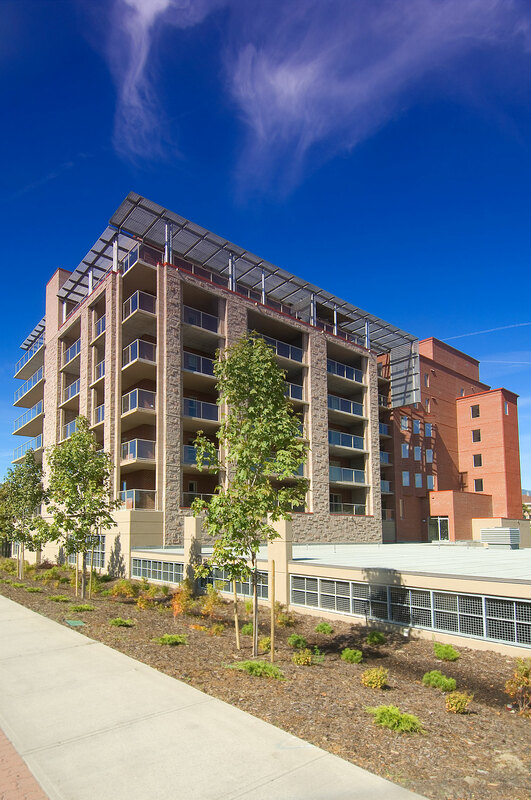 Combined with the balconies, the rooftop terraces and plaza area offer residents three possible choices for exterior private common areas each with its own benefits. The project also features a number of affordable housing units. These suites are mixed into all four of the buildings and are a commitment to providing housing to the community.